vCloud Director 5.1.1, vCloud Networking and Security 5.1.1, ESXi 5.1.0a, vCenter 5.1.0a Released! Looks like there are a couple of new features in vCloud Director like Elastic vDCs which will be worth looking into, but otherwise its all bug fixes. I haven’t been having any issues per se, so not sure how much value I will get out of these updates, but will hopefully get these installed next week to ensure I am up to date with the latest patches and try play around with the new vCloud Director features. But the timing is a little surprising. I was not expecting VCE to release their compatibility matrix with vSphere 5.1 so soon after VMware’s GA release. Normally they take a good couple of months after a major release to test product integration with all the vBlock components… Saying that it does look like the number of changes are relatively minor for a major release. Normally VCE would take the opportunity to refresh all the components across the vBlock, especially field notices for the Nexus and VNX, but it looks like the emphasis on this release has been to get vSphere 5.1 out ASAP. I’m guessing promises were made somewhere! Saying that I would not recommend deploying this if you are a VCE customer until the vSphere 5.1 Update 1 is released, especially if you are in a large organisation where major upgrades can only be undertaken once or twice a year. New releases are always a little buggy and I doubt this will be any different… We had enough issues when vSphere 5.0 was released… the sort of minor problems I would rather not go through again. Not because of the business impact, just because of the time spent on the phone diagnosing and identifying faults. Additionally major upgrades are disruptive and it makes sense to ensure the matrix you upgrade to won’t need to be upgraded for a good 6 months or so, especially since you know the next matrix release is going to contain all the updates they couldn’t squeeze into this one. So I am busy building a next generation proof of concept environment for our vBlock 300HX – vSphere 5.1, vCenter 5.1, vCloud Networking and Security 5.1, Trend DS 9 and of course vCloud Director 5.1. I went for the appliance version as this suits my requirements to a tee – easy to deploy and get up with a minimum amount of fuss. Or so I thought! It was indeed easy to deploy and get started but one aspect that did not working at all was the console sessions of my virtual machines. 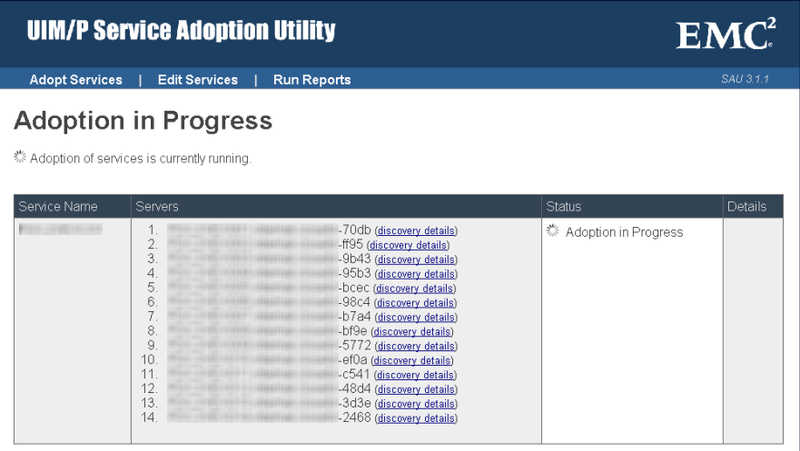 I spent a few hours on the phone with VMware trying to get the console working on the vCloud Director appliance. After messing around with the eth0 and eth1 adapter settings – first they were on separate VLANs, then we moved them to the same VLAN, then we added in static routes to god knows everywhere, pinging from VCD to ESXi, VCD to my Windows 7 Desktop, Win 7 desktop back to UI and Console interfaces, etc… Even when we could ping all interfaces and hosts and clients it just would not work. And eventually we changed the net.ipv4.conf.all.rp_filter value to 0… hey presto everything started working like magic. In hindsight I actually remembered seeing this post before, but didn’t think much of it at the time. doh. 2 hours on the phone wasted! 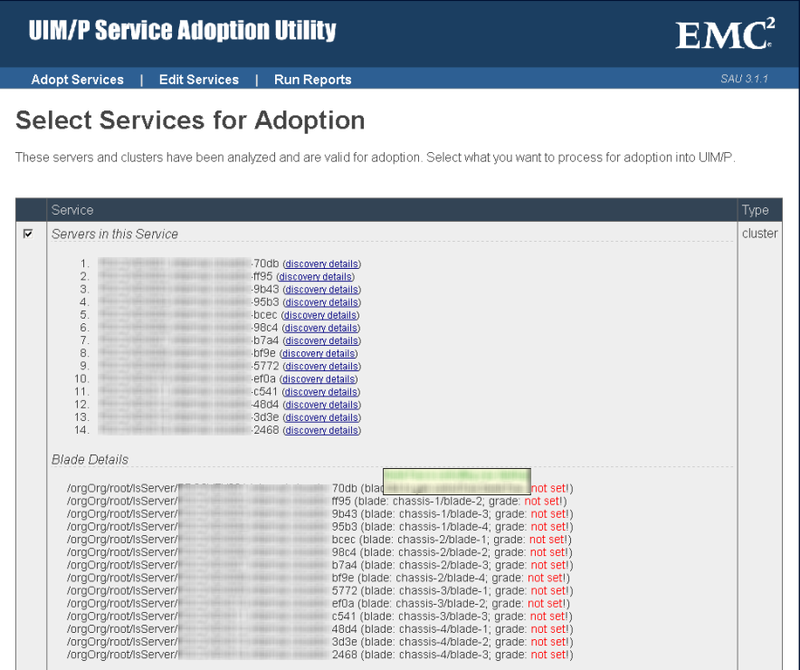 Recently included with UIMp is the Service Adoption Utility. The Service Adoption Utility was originally a standalone tool to assist customers who wanted to import environments into UIMp that had not been provisioned with UIMp. If you for example added a datastore natively in Unisphere and masked it to all your ESXi hosts, it would not be visible in UIMp as part of the existing service offering. If that service offering was ever expanded, by adding a blade to the service offering, that datastore that you had manually masked to your ESXi hosts would not be automatically masked to the new ESXi host that you had just added to the service offering. This inflexibility was infuriating and was not just an issue with datastores, but across all UIMp managed components. Want to add a new VLAN to your service offering in UCS Manager? Bad idea for the same reason and until recently you could not add new VLANs to existing service offerings. This put organisations into a real catch 22 – Because UIMp was incapable of detecting or importing changes made outside of UIMp, you could no longer use the native management tools but UIMp until recently didn’t have any elasticity functionality. I spent the whole Christmas week in 2011 rebuilding our entire service offering with VCE because we wanted to add some new storage grades to our existing service offering. There was no elasticity or Service Adoption Utility at that time so we spent 5 days re-provisioning the cluster and getting it back into a production state. Now with the Service Adoption Utility all those troubles are a distant past. You can now run a mixed environment. You can make changes outside UIMp with the knowledge that these changes can be imported back into your existing service offerings, if required. Not only that but if you ever have any issues provisioning new datastores or VLANS, you can finish the configuration manually in Unisphere or UCS manager and run the SAU to import the changes. Not only will the SAU import the new config, but it will delete the partially provisioned objects from with UIMp. Frikkin awesome! You’ve added your vBlock and all the credentials and the discovery must first be successful without any failures. You’ve run ‘Validate Setup’. Setup Validation must return a status of Warning or Ready. If status shows “Failed” then you will need to click this link and review the Compliance Rules that came back with a Compliance Status of “Error”. Once these are successful, you can then proceed with the Service Adoption Utility to import your existing hosts, LUNs, etc. Note: This is best done with EMC (at least the first time), just to be on the safe side. The tool will do a discovery of your infrastructure to determine which components are not currently included in an existing service offering. UIMp will spit out a list of Blades, VLANS and datastores for you to import. 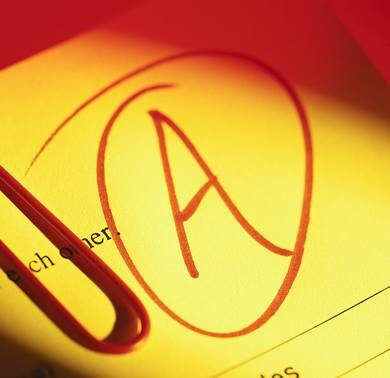 You have to assign the grades for the blades (you can see the warning ‘grade not set’ below as this has not been done yet. Datastores will automatically be imported depending on the storage pool. 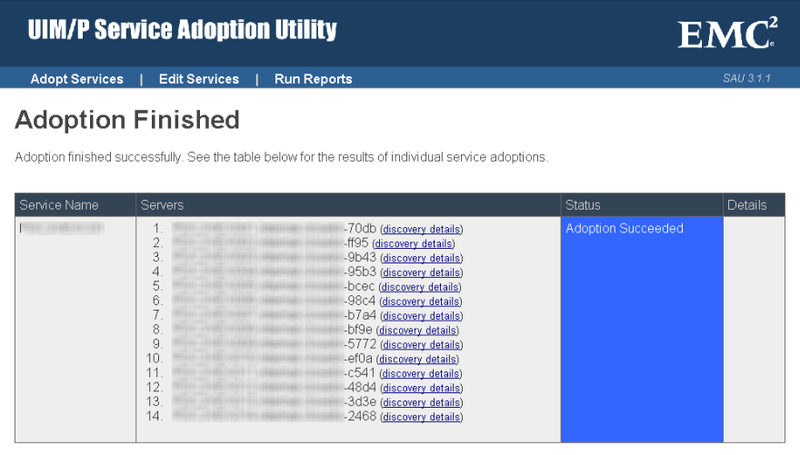 And finally you should hopefully see a nice ‘Adoption Succeeded’ status as per the screenshot below. Job done! Logging into UIMp you should now see the new service offering available under the Administration->Service Offering tab as per the screenshot below. The service adoption utility has revolutionised UIMp. It single handedly takes away its major weakness – its inflexibility to co-exist with existing environments, and environments that change outside of UIMp. Good job IONIX UIMp team! EMC Ionix Unified Infrastructure Manager/Provisioning or better known as UIMp is the vBlock provisioning tool. I must say I have been a big UIMp sceptic. When I got my hands on a vBlock in December 2011 UIMp was around version 2 and it was crap! UIMp was only fit for purpose during the vBlock deployment in Cork. It could provision multiple service offerings (ESXi Clusters) automatically, performing a number of manual tasks across UCS, VNX, Nexus and vSphere services, allowing VCE to meet their 30 day bare-metal to customer install lead times, but once the service offerings were provisioned that was pretty much it. The only practical feature available to customers was to add datastores to your service offering. Woaw! Slow down tiger! And VCE had the cheek to charge you a fortune for the licenses… It was alot easier just to turn UIMp off and use the native management tools directly, which is what a lot of customers ended up doing. Back in the day if you wanted to add a blade to an existing ESXi cluster… no problem, just decommission and recreate the service offering – that means blowing away the cluster, UCS profiles, storage LUNS, and ESXi hosts. No small feat and if you are a single company, you’re normally going to have one or two service offerings, say Production and Test&Dev. Not exactly usable. Well things have improved dramatically since then. Flexible service offerings were introduced in v3.0, if I remember correctly, and they allowed customers to add blades to (expand) an existing service offering. It was a big improvement and a step in the right direction. But I must say having just installed UIMp 3.1.1.2, which is the latest version just released in the last few weeks with the newest vBlock Compatibility Matrix, I am slowly being converted. One of the reasons I am slowly being converted is that while UIMp was out of action I tried to manually provision some blades and I could not get the zoning and masking configured correctly… I ended up putting it off until I had completed this install, which made me appreciate how simple UIMp makes even the most difficult provisioning tasks. 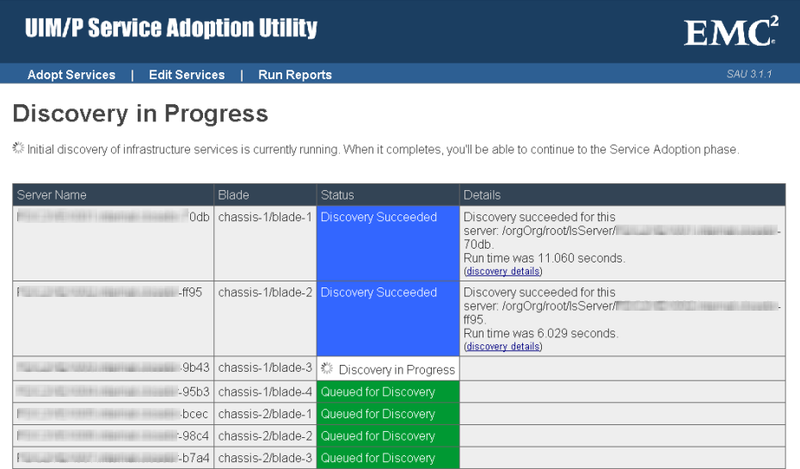 As I deployed a fresh install, I ran the service adoption utility (more to come in another post), which is extremely slick and had our existing vBlock service offerings imported in a few minutes. What’s missing? There are a couple of native features that are on the todo list I believe. I would really like to be able to choose the LUN ID when deploying datastores. It is extremely useful if you are replicating datastores between two different arrays, with for example, EMC RecoverPoint, to have the same LUN ID in both datacentres. Other than that, if you have a vBlock and are thinking of upgrading, I highly recommend it. Shame on you VMware! Shame on you! VMware, I am not impressed. Guess the release date of SQL Server 2008 R2 SP1 for me, will ya? I’ll give you a hint… Since it has only just been approved for use with vSphere 5.1, you’d hazard a guess recently, right? SQL 2008 R2 SP1 was released in 11th July 2011. Date approved by VMware: 10th September 2012 (vSphere 5.1 release date). Come on VMware… seriously? 14 months to approve a SQL service pack? That’s a joke. I recently found out our administrators had applied SP1 to our SQL 2008 R2 servers earlier this year, when I tried to raise a support call and it was pointed out we were actually outside the VMware matrix. I’m running vSphere 5 Update 1 but I cannot apply SQL 2008 R2 SP1 or even SP2 because VMware are being slack! Someone needs to up their game or loosen the compatibility matrix.